This is Hollister Peak as seen almost from Morro Bay looking back towards San Luis Obispo. The Rocking J Ranch is in the foreground.. Framed in a vintage gold leaf frame.21 x 32 matted and framed..
Five of the Seven Sisters can be seen from this vantage point on Corbett Canyon Road. The viineyards were in their autumn color glory. 16 x 20 matted and framed. 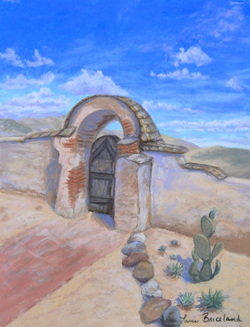 This painting received Honorable mention in the Professional Division for Pastel Representational at the Midstate fair in 2011. Estero CreekView of Estero Creek just before it enters the Estuary in Morro Bay. View taken from Turry Road and South Bay Blvd. 11 x 14 matted and framed. 18 x 22 matted and framed in a beautiful vintage gold leaf wood frame. 18 x 24 matted and framed. Though still muddy from the recent rains, it was a perfect day to hike. All the familar signs of our spring: Oak tree, green grass hills, billowing yellow mustard and the bright orange pop of our state flower 16 x 20 Painted on a canvas texture paper . 18 x 24 mated and framed. Rapids rush by in anticipation of winter in Michigan. 12 x 16 matted and framed. I call this my Van Gogh moment. A beautiful Day for a hike!. Image 8.5 x 11, matted and framed to 11 x 14. This is a nice memory with my kids! A beautiful day and a field of mustard as far as we could see. 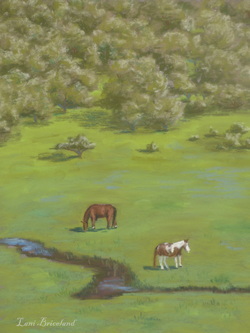 Image 11 x 14, matted and framed to 16 x 20. 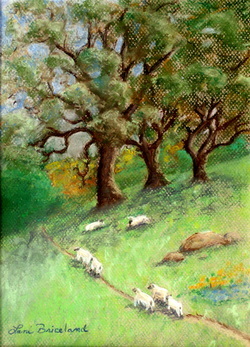 What lucky sheep, all that fresh green grass to eat and sit in the shade of the Oak trees. 14 x 18 matted and framed. 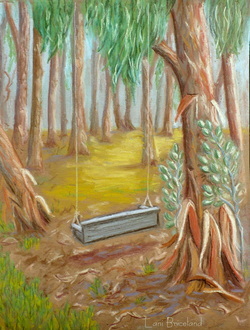 Inspired by our many Eucalyptus groves, I love the fresh pungent scent. 14 x 18 matted and framed. I loved the unique style of each of the gated entries to the mission. They each have so much character. 14 x 18 matted and framed. This is the field at Avila Barns at the end of the season. I enjoy seeing the seasons change though subtle as it may be.